Can Sri Lanka thrive on overseas challenges? Over the course of the last few years, many top teams have failed to reach success in overseas conditions. Playing in Asia has been an arduous task as most of the teams struggle to counter the turning ball; conversely, the sides from the subcontinent have huge concerns of playing in seaming decks. In the past, overseas conditions were nothing to be apologetic about, but nowadays, the statistics suggests that every team have had tough times touring certain continents. Since the start of 2013, the home side has won more than 55 percent but the tourists have a win percentage below 25 in the longer format. As the front runner of the Test rankings Indians haven't been to perfection outside the subcontinent but the limited overs record has salvaged pride for them. On the other hand, the teams outside Asia have had plenty of troubles in dusty decks as they have failed to post substantial totals on Asian surfaces. The teams who have had a magnificent run of success at home such as Australia and England were trounced in this particular region while the other touring nations haven't got much favorable results to flourish in the longer format. All in all, Australia has been the best touring nation in Tests averaging over 30 and in ODIs, South Africans leads the tally while Indians are the second best travelers considering the average. It has been a long harrowing wait for the Islanders as they haven't won a single bilateral ODI series in last two years since the victory over Ireland. Sri Lanka's overseas record has fallen miserably since the retirement of many seasoned campaigners. In the period between 2010 and 2015, Sri Lankans have got 5 ODI series win outside subcontinent but unfortunately, the series victories over Zimbabwe and Ireland are the only climaxes after that phase. After 2015, Lankans have travelled outside Asia for a Test series in 4 instances but they only took honours in Zimbabwe. The Islanders have been vanquished in Tests and ODIs as they have never won a single series on Indian soil. Dinesh Chandimal has a healthy average of 61 including 2 fifties and 1 hundred in the longer format while Angelo Mathews has been impactful in the 50 over format as he has amassed 567 runs at an average of 113.40 playing against the home side India. Despite the horror run in India, it has been a remarkable outing for the Lankans in Bangladesh as they have never lost a series in that particular part of the world. Dinesh Chandimal has continued his brilliant record in the subcontinent as he averaged over 50 in the longer format playing in Bangladesh. 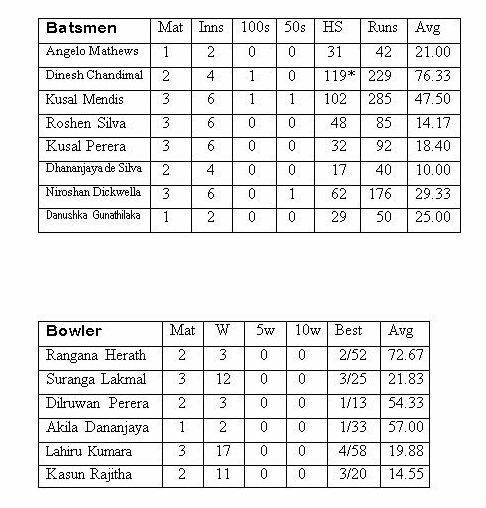 The spin duo, Rangana Herath and Dilruwan Perera have picked up 13 and 15 scalps respectively. The Islanders handed the first Test series defeat for Pakistan at their adopted home of United Arab Emirates in 2017 but disappointingly, Sri Lankans haven't been impressive in the shorter format as they were overpowered by the hosts in the last 3 meetings in UAE. 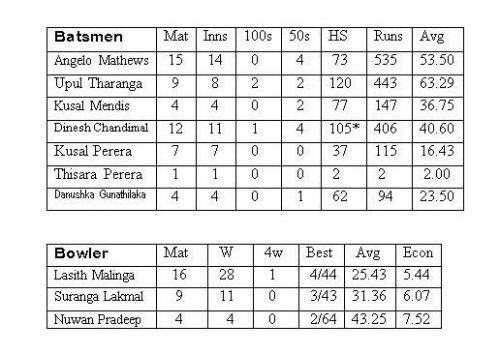 Dimuth Karunaratne and Dinesh Chandimal have averaged over 40 in Tests and Upul Tharanga has been the standout batsman in those conditions accumulating more than 400 runs in ODIs. Among the bowlers, Rangana Herath has 40 wickets with 3 five-wicket hauls while the paceman Suranga Lakmal has dismissed 18 batsmen in Tests. According to the ICC Future Tours Programme (FTP) for the five-year cycle from May 2018-May 2023, the Islanders are scheduled to play 43 Tests, 71 ODIs and 46 T20Is. Surprisingly, Sri Lankans will only play one home Test series in the two years between July 2020 and June 2022, it's against Bangladesh. Sri Lanka will play in South Africa and India in 2 instances, Australia and New Zealand will host Sri Lanka 3 times apiece while Sri Lankans will travel only once to play a bilateral series in England and West Indies in that particular period. Possessing experience on foreign soil can be decisive. As most of the players from the current line-up are lacking experience, the seasoned players will be key to victory. Here we have a detailed statistical look on Sri Lanka's success outside Asia. Sri Lanka secured a historic Test series win in 2014 at Headingley. Angelo Mathews's sublime centuries and a masterpiece by Kumar Sangakkara guided the islanders to script the series victory. Apart from Angelo Mathews, all the other current players haven't live up to expectations as they have maintained averages below 45. Surprisingly, the front line pacies haven't been impactful in English conditions. 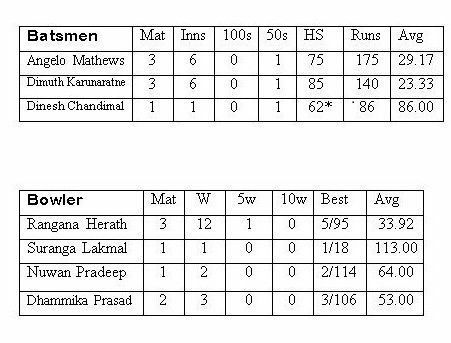 Nuwan Pradeep has dismissed 16 batsmen while his partner Suranga Lakmal averaged over 50. The veteran spinner Rangana Herath has picked up 20 wickets playing 7 Tests. As per the FTP, Sri Lanka will not play a single Test series in England within the five-year period. Angelo Mathews has continued his magnificent form in this particular part of the world as he has an average over 50 playing against the hosts. 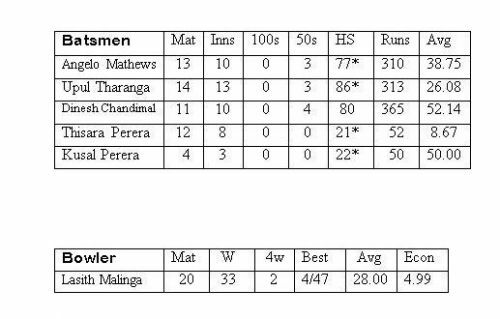 Upul Tharanga and Dinesh Chandimal have been the standout performers accumulating over 400 runs. 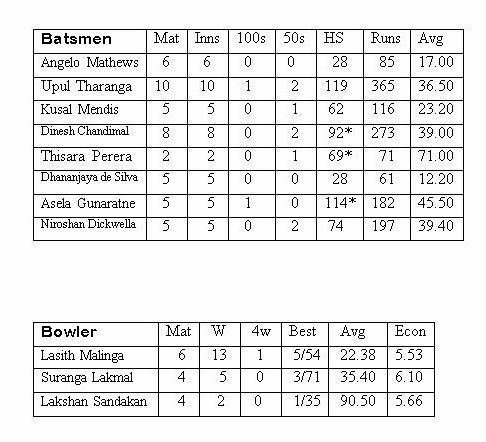 The limited over specialist, Lasith Malinga has 28 scalps including a 4-wicket haul. Suranga Lakmal and Nuwan Pradeep will bank on experience in the upcoming assignments. 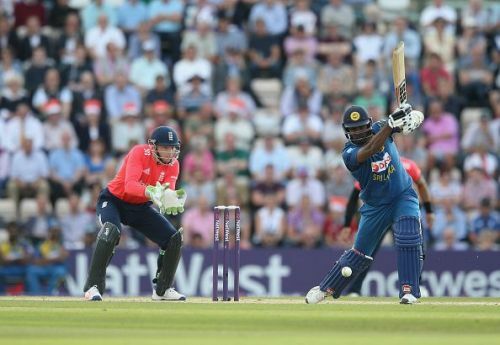 Sri Lanka has found success in limited overs cricket in England. The experience gained from the ICC World Cup 2019 will be a huge boost for the youngsters to overcome the England challenge in June 2021. If the top order gets going, Sri Lanka can fancy their chances of an ODI series win. The Islanders lack experience in Australia. 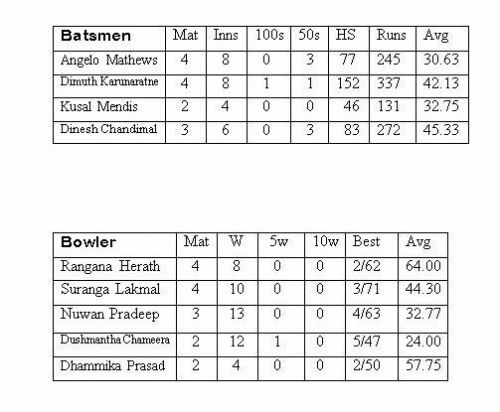 Angelo Mathews and Dimuth Karunaratne have played only three matches each, averaging below 30. The skipper Dinesh Chandimal has been a part of a solitary Test match, posting an unbeaten 62. Among the bowlers, Rangana Herath has been impressive picking up 12 wickets including a 5-wicket haul but it has been a sorrowful fate for the pacers. 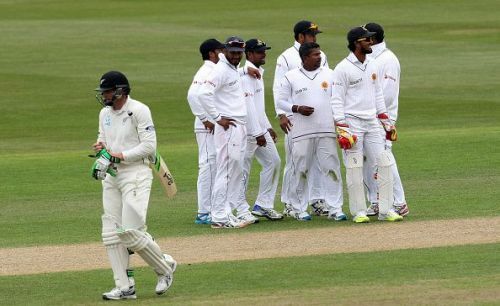 After Sri Lanka's tour of New Zealand, the Islanders will travel to Australia for a 2-match Test series in January 2019. As the pitches equally offer considerable resistance for batsmen and bowlers, the performances of Angelo Mathews and Dinesh Chandimal will be key to Sri Lanka's success in Australia. Despite being substandard in the longer format, Angelo Mathews has gone past the half-century mark on 3 occasions featuring in 13 ODIs. Dinesh Chandimal averaged over 50 with 365 runs under his belt. 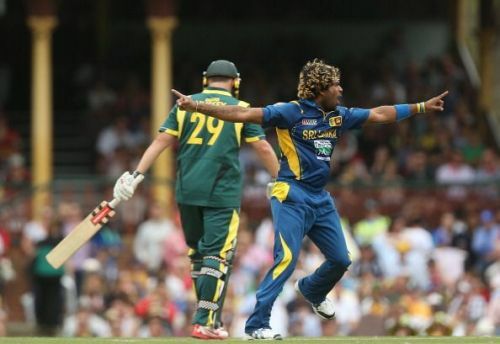 Lasith Malinga has 33 dismissals including two 4-wicket hauls playing 20 ODIs against the hosts Australia. According to Sri Lanka's away series itinerary, Sri Lankans will not feature in an ODI series in Australia within the five-year period. The Test opener Dimuth Karunaratne had a successful outing in New Zealand as he has piled up more than 300 runs at an average of 42.13. 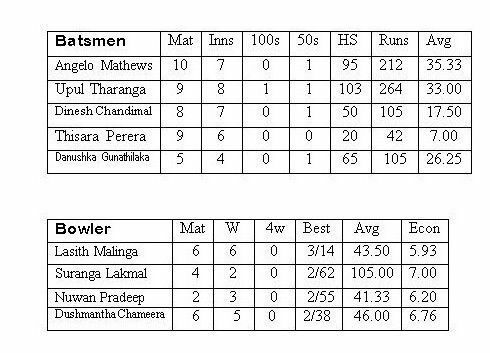 Angelo Mathews and Dinesh Chandimal have amassed 3 fifties each. Currently, Dushmantha Chameera is the only bowler who has achieved a 5-wicket haul in New Zealand. Suranga Lakmal has 10 scalps in 4 Tests and Nuwan Pradeep leads the tally with 13 wickets. With the pitches in the Kiwi land having a greenish tinge and more swing, the Lankan camp will be hoping for an all-round contribution from the top order batsmen. On the other hand, the pacers will have their work cut out against New Zealand in December. Upul Tharanga and Angelo Mathews have crossed the 200 run mark at an average over 30. It has been a disappointing run for Dinesh Chandimal and Thisara Perera but they will be looking to turn the tables in ODIs. The experienced campaigner Lasith Malinga, has only managed to grab 6 wickets out of his six outings. The rest of the pace attack hasn't been imposing. New Zealand will be favourites when they host Sri Lanka for a 3-match ODI series in December. Sri Lanka will expect its floundering middle order to take more responsibilities and the mediocre stats of the bowlers will leave plenty to ponder for Sri Lankan selectors. These statistics present a dismal aspect as the top order hasn't been able to convert the fifties into centuries. Angelo Mathews has accumulated over 300 runs including 2 fifties while Dinesh Chandimal has a below-par average of 23.30 playing 5 Tests. In 2017, Youngster Lahiru Kumara exploited the seaming conditions to grab his maiden 5-wicket haul. Among the current bowlers, Suranga Lakmal is the only bowler with an average below 35. Rangana Herath leads the list with 16 wickets. Batting in South Africa has been a nightmare for many teams around the world. Sri Lankans were rattled by pace and bounce in the last series but they will be going into the 'Rainbow Nation' high on confidence as they whitewashed the Proteas at home. Sri Lanka will play a 2-match Test series in February 2019. Though the Lankans were overpowered in the last few instances, the batsmen were able to make a mark. Dinesh Chandimal has scored 273 runs at an average of 36.50. Opening batsman Upul Tharanga has accumulated over 350 runs including 2 fifties and 1 century. With less experience in foreign conditions, Asela Gunarathne posted a fighting century in the recent tour but it was in a losing cause. Undoubtedly, Lasith Malinga dominated proceedings as he dismissed 13 batsmen including a 4-wicket haul playing 6 ODIs against the hosts South Africa. As Kuldeep Yadav and Yuzvendra Chahal spun Indians to a remarkable series victory in South Africa, the Islanders will also expect a much-improved performance by the spinners. The skipper Angelo Mathews will be anticipating to improve on poor ODI record in South Africa. Sri Lankans toured West Indies for a Test series after 10 years in 2018. As most of the players were playing their first Test series in the Caribbean, the senior players had more responsibilities to guide the newbies. The skipper Dinesh Chandimal amassed 229 runs in 2 Tests at an excellent average of 76.33. Kusal Mendis steadied the ship for Sri Lanka by scoring an outstanding century. The pacers had a remarkable series as well. 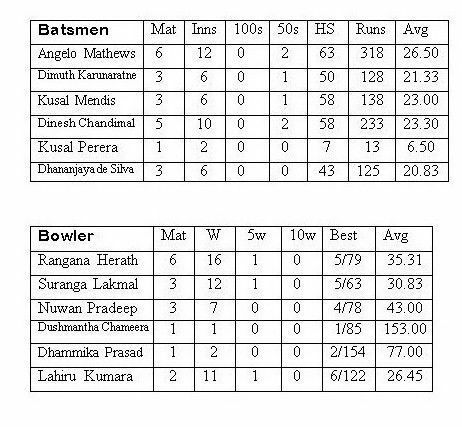 Featuring an 3 matches Suranga Lakmal and Lahiru Kumara picked up 12 and 17 wickets respectively. The debutant Kasun Rajitha stunned the Windies by dismissing 11 batsmen in 2 Tests. Angelo Mathews & Co will be featuring in a 2-match Test series in mid- February 2021. The promising pacers will be hoping to continue the run of success and a consistent performance by the batting unit will open up chances for a series whitewash in the Caribbean. 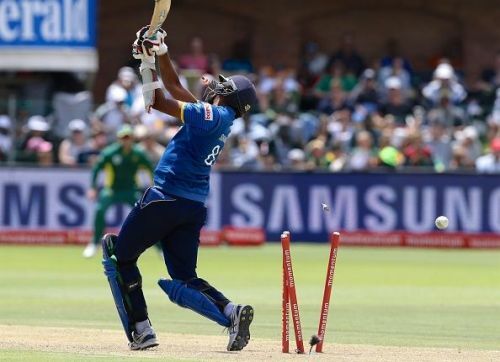 Although Upul Tharanga has more experience playing against the hosts, he has failed miserably. Angelo Mathews and Dinesh Chandimal have featured in 2 ODIs and in the year 2013, an unbeaten 55 by Angelo Mathews helped the Islanders to post a decent total on the board. Among the bowlers, paceman Lasith Malinga has 4 scalps at an average of 27.50 playing in 3 ODIs. In 2021, Sri Lanka will be playing 3 ODIs against the Windies. The fortunes will be relying on few seasoned players. The likes of Angelo Mathews and Dinesh Chandimal will be playing a major role and most importantly, the youngsters would be groomed well.